Danny the Dragon Gets a Five-Star Review from the Lone-Star State! It’s been such a pleasure being able to tour around the country, and even the world, on my Danny the Dragon Book Tours. As a result of our travels, you never know in what neck of the woods Danny and I are going to be mentioned in next! 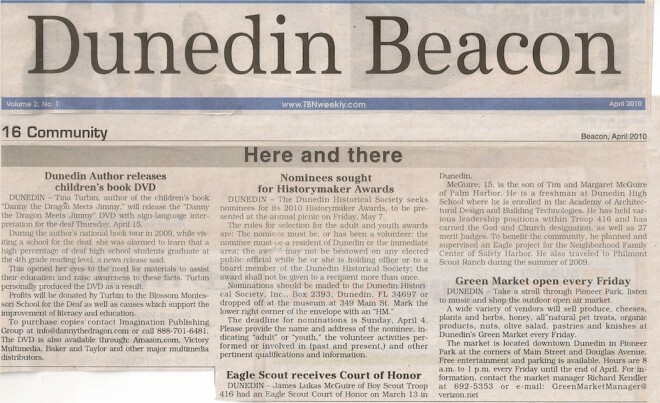 What a pleasure it was discover our names in the Baytown Sun of Houston,Texas! Danny and I Appear in a Tampa Bay Publication! It’s always so exciting when Danny and I are mentioned in the papers! 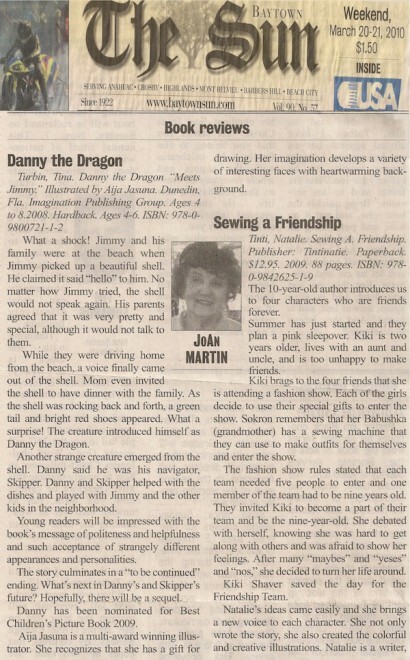 During my Danny the Dragon East Coast Book Tour, we really made waves as reviews and news of Danny the Dragon Meets Jimmy seemed to pop up everywhere. I just had to share one of the articles with you that is particularly special to me! Danny the Dragon Featured in the Virginia Library Association’s Annual Conference! Danny is indeed a very well-traveled dragon!!! He has participated in book fairs and conferences all around the world, and now he can add Portsmouth, Virginia to the list of places he’s visited: Danny the Dragon was featured in the Virginia Library Association’s Annual Conference where he hobnobbed with a fine group of librarians and some of the top publishers in the industry! 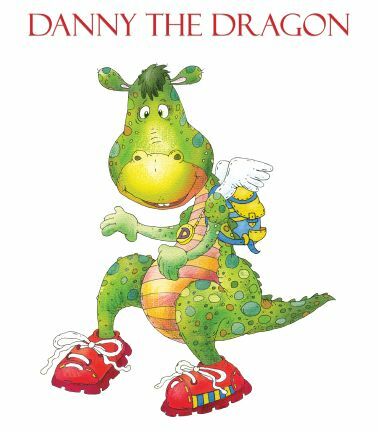 As you can imagine, as a children’s author, I do a lot of reading and love to pass on to Danny the Dragon fans my children’s literature recommendations. You’ve probably heard me talking about the illustrated kids book by Kevin and Laura Sanchez, Nikki’s Hurricane Adventure, and the amazing true story behind it. If not, here’s a refresher: Nikki the cat was separated from her family in 2008 during an evacuation for Hurricane Gustav 85 miles from home, and she found her way back 4 months later! Her owners Kevin and Laura later wrote down their imagined adventures of Nikki the Cat, and Nikki’s Hurricane Adventure was born! What’s more, half of the profits of the book are being donated to cancer research. Danny the Dragon Makes the News in Iran! 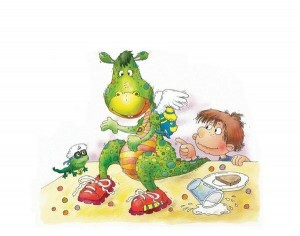 Danny the Dragon is quite the worldly traveller–he’s made the news in Iran! www.ibna.ir, the Iran Book News Agency, has reported that I took first place for Best Illustrations in the Five Star Publication Purple Dragonfly Awards for my illustrations by Aija Jasuna. 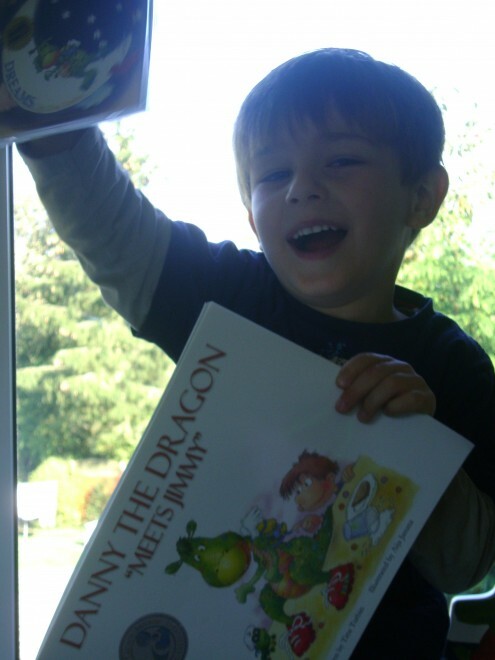 This Child Loves Danny the Dragon! This lovely and heartwarming letter came in to me today from a mother in England who purchased a book via this Danny the Dragon website. As an author this is one of those special moments in our lives that we know we are doing what we love and it is touching others. I think any other children’s author will agree with me on this. Thanks again for the great service via the site and the ordering arrangement. As for some of the extra bits and bobs sent in the package ( door hangers, bookmarkers, tattoos, pencils) some of them Ro intends to share with his friends. They will all be enjoying Danny the Dragon here in England. One of the most important parts of being a writer is staying true to your vision and standards. This can be pretty tough in today’s world when many agents and publishers put pressure on you to alter your creation so that it is…. (that dreadful word!) marketable.